Whether for gymnasiums, Military Bases, Gymnastic clubs, Wrestling rooms, climbing gyms, CrossFit or any other application, you'll want to climb with the very best climbing rope in the game. Climbing rope for workout/exercise are a must in gym situations for team or individual sports, use in pairs or as a single rope. 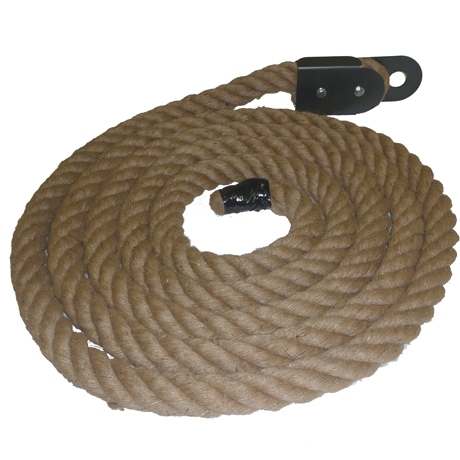 Our 25' indoor climbing ropes are made of superior quality four-strand 2" diameter natural fiber, and come complete with specially designed 11 gauge steel eye-hook on one end, making installation literally a snap. One thing you definitely Do Not want to skimp on is the quality of your climbing rope, especially if you're 25 feet in the air.